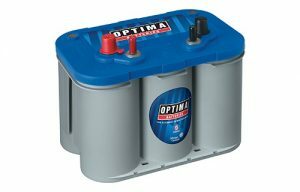 Optima Blue Top is a well-known brand of premium marine AGM batteries (recognizable by their distinctive looks), and very popular among anglers and experienced boaters alike. 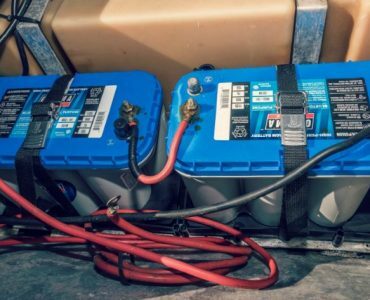 In this Blue Top marine battery review, we’ll cover all information you need to become familiar with Optima Blue Top features, as well as considerations in determining whether this is the right battery for your specific boat and purposes, and if they are worth the high price tag. Do you need a special charger? What should I do to store and maintain Bluetops? How many years do Optima Bluetop batteries last? Do Optima Bluetops have a Lifetime warranty? 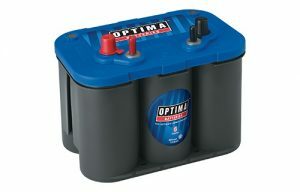 Optima Blue Top batteries are priced higher than some other marine batteries, but Optima’s advanced technology has resulted in a battery design of uniquely high performance and convenience. The durability (shock resistance) and exceptional longevity (when best charging practices are used) make a BlueTop battery an excellent value and an extremely popular choice for long-time anglers and boaters. Optima’s sealed absorbed glass mat (AGM) batteries do not degrade or spill the way conventional flooded batteries notoriously do. 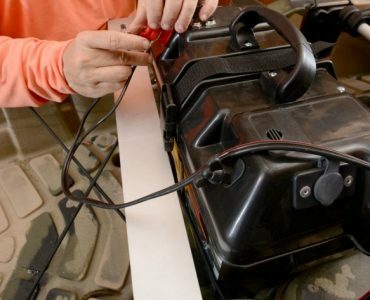 With a traditional battery, electrolyte fluid levels must be maintained by checking and refilling as necessary to prevent battery from failing and to prolong the life of the battery. The AGM design retains the electrolyte in a state of suspension while simultaneously keeping in contact with the plates’ active lead material. This generates higher efficiency of discharging and recharging. Optima’s state-of-the-art Spiral Cell Technology consists of a configuration of spiral-wound cells, with each in the series made of two 99.99% pure lead plates. Each plate is precision-coated with lead oxide. This unique battery design generates more power, consistently outperforming batteries with traditional flat-plate designs. 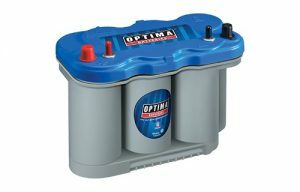 Optima batteries utilize 99% virgin lead plates, resulting in a lower weight battery of equal capacity. The Optima Blues consistently live up to their reputation for having an extraordinarily long battery life expectancy, provided they are charged properly. The Optima Blue Top 34M model has been cycle tested to as many as 350 discharges, which is about 2-3 times the lifespan of regular marine batteries. This is a key benefit for frequent boaters and anglers who discharge their batteries on a daily or weekly basis. The sealed AGM design is inherently vibration resistant, but the Blue Tops feature the SpiralCell technology with broad plate area that yields significantly better resistance to shock and vibration. Being completely sealed and fully self-contained, there are no openings or reservoirs through which the battery can lose its acid. This allows mount the battery in virtually any position you prefer, which is helpful in cramped boat compartments. Blue Tops feature both dual SAE studs and threaded 5/16″ studs. The SAE stud is convenient for attaching a charger, and the threaded studs are great for permanent attachment to the power and charger cables in your boat. For most freshwater fishing boat applications, 800 CCA is plenty for starting outboards. It is wise to consult your owner’s manual for exact requirements of your outboard. The Blue Tops have CCA ratings from 750 to 900 which is plenty to fire up most outboards. The beauty of dual-purpose AGM is gaining the deep cycle capability to run your electronics. There is a Blue Top for practically any fishing and boating application. Here is a comparison chart of each Bluetop model, so you can quickly see and compare the different sizes. “D” indicates dual purpose, and “M” stands for marine use. Reserve Capacity = RC is the number of minutes a new battery can output at a constant load of 25 amps, at an ambient temperature of 80F. C20 Capacity = C20 is basically how much total energy can be stored in the battery. It is the number of Amp hours it can output continuously over 20 hours at an ambient temperature of 80F, before falling below the 10.5-volt threshold. CCA = Cold Cranking Amps is a measure of the power a battery can provide at 0°F for 30 seconds while keeping the voltage above 7.2 volts. The D31M has the largest Reserve Capacity in the series, making them the best choice for use with trolling motors on medium to large sized freshwater fishing boats. Some will doubt this, based on the smaller RC than comparable wet cell batteries. But the fact remains, the Blue Tops are tough and work great in 12, 24, and 36V trolling systems. With 900 cold cranking amps, the D31M is a capable marine starting battery as well. If you have many accessories (especially large fish finders) powered off the starter battery, running a Dual Purpose AGM like the Optima really makes a lot of sense. The D27M is the lighter and more compact sibling to the D31M. It looks nearly identical but has a smaller case size, as well as scaled down reserve capacity. A set of D27M can run trolling motors on medium size fishing boats. It can also be used as a cranking battery, best suited for boats with just a few smaller fish finders and accessories to power. Bigger bass boats would be better suited to get the D31M. The D34M is the smallest dual purpose Blue Top. 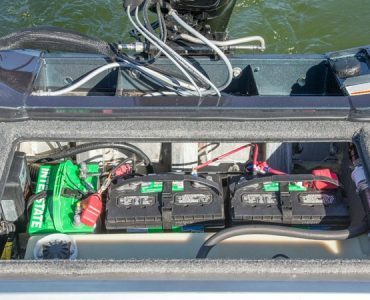 It shouldn’t be used in bass boats or other high-performance fishing boats, but it would make a great marine battery for smaller fishing boats, pontoons, and pleasure craft. At 43.5 lbs it is a lightweight battery with a still impressive 120 minutes of reserve capacity. The 34M is a cranking only marine battery, so don’t expect to be able to run big power hungry fishing electronics off this one. 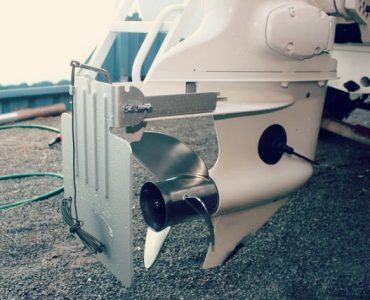 Instead, use this to crank the outboard and power a few accessories like pumps and lights. Then get a secondary battery just to run fish finders. The 34M is a good starting battery, no worries there, it’s just not large enough for powering fishing boats with all the bells and whistles. A lot of the time, issues with batteries are due to inadequate or improper charging procedures. It’s so important to know what charger to use and how to maintain your battery properly. This strategy is going to extend the life and give you less of a headache down the road. Yes and no, at minimum your onboard charger needs to have AGM capabilities or you will damage the battery cells. Just be sure the charge profile is in agreement with the recommended specs as found here. These charging specs are from the manufacturer themselves, so it would be smart to follow that in order to get the best performance out of these expensive batteries. 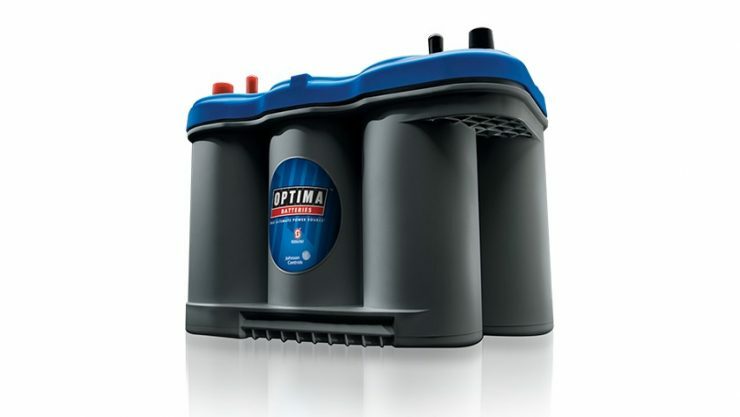 Alternatively, OPTIMA offers their own digital chargers they claim to take the most advantage of the unique performance of the Blue Top capabilities. The OPTIMA chargers are able to charge faster and safely maintain them during storage. Optima batteries use a high % of virgin lead and have a much slower self-discharge rate than many other batteries. Even so, it’s best practice to use a battery tender to keep the charge above 12.4 V. You can also check the voltage manually every few months and top off as needed. If there is even a small current draw from onboard accessories, the maintenance charger will provide charge to keep the voltage at a range of 13.2-13.8 V.
There are no guarantees, of course, but when properly maintained many users report a range of 4-8 years of service. There are always circumstances where this is much less, such as defects and faulty chargers, among other things. The best thing you can do is buy an OPTIMA charger, or at least a quality marine charger with AGM settings, and follow the charging specs exactly. There is a reason Blue Tops are expensive, and quality tends to pay off in the long run when using best practices. Unfortunately, OPTIMA batteries do not have a lifetime warranty. Instead, they have a pretty solid 2-year replacement warranty. Be sure to save your original receipt, as the 2-year warranty starts on the date of purchase, and to make any claim you will need that receipt. They need all the info on that receipt, like the place of purchase and to verify you were the original purchaser of the battery. There is a way to get a 3-year warranty. All you have to do is buy the OPTIMA Digital 1200 charger in the same transaction as your 12V battery. Again, save your receipt, and be sure to register your products to ensure you get this benefit.